Liquitex Basics paint is formulated to offer dependable standards of performance at a more affordable cost. What is the difference between professional acrylic paints and student acrylic paints? Professional acrylic paints such as Liquitex Heavy Body and Liquitex Soft Body are formulated to use the maximum amount of pigment to achieve the ideal mixing and working properties and are milled to achieve thorough and complete dispersion of pigment within the vehicle, regardless of the resources required. Student acrylic paints such as Liquitex BASICS are formulated with sufficient pigment to offer dependable, if not ideal working properties and use pigments that in most cases require fewer resources so that they can be milled more quickly and efficiently - this means that they're going to give quality results at a great price. 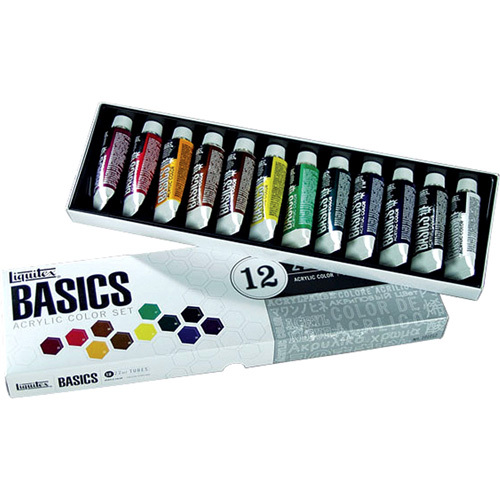 This set contains 12 x 22ml tubes of Liquitex Basics Acrylic Colour. Colours: Alizarian Crimson Hue Permanent, Primary Red, Cadmium Orange Hue, Burnt Sienna, Burnt Umber, Primary Yellow, Light Green Permanent, Phthalo Green, Primary Blue, Dioxazine Purple, Ivory Black, Titanium White. I feel that beginners shouldn&#039;t be encouraged to use student colours. It can give them the wrong impression of the medium. Start with the best that you can afford and then use the basics for jobs that don&#039;t particular matter.